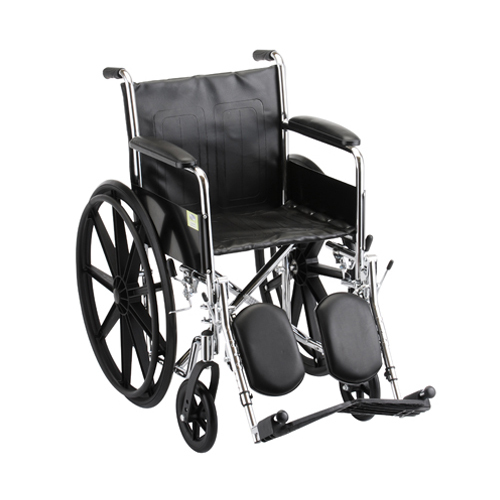 The Nova Steel Wheelchair comes equipped with fixed full-length arms and elevating legrests. The Nova Steel Wheelchair comes equipped with fixed full-length arms and elevating legrests. It also features dual axle positions for quick seat height conversion and flame retardant black vinyl upholstery. * Because of the fixed arms, the actual width between the arms is 2" less than the full seat width measurement. Seath Width: 16" / 18"
Overall Dimensions Open: 23.25" W x 30.25" D for 16" / 24.5" W x 31.5" D for 18"
Rear Pockets: 14" W x 11.5" D for 16" / 10" W x 8.5" D for 18"
Overall Width Folded: 10.75" for 16" / 11.25" for 18"
Overall Depth Folded: 29.75" for 16" / 11.25" for 18"
Overall Depth: 30.25" for 16" / 31.5" for 18"
Footrest: Aluminum on 16" / Plastic on 18"
Seat Width Between Arms: 13.75" for 16" / 15.75" for 18"
Arm Height from Seat: 9.5" for 16" / 10" for 18"
Back Height from Seat: 15" for 16" / 14.75" for 18"
Overall Height: 36" for 16" / 36" for 18"
Overall Width: 23.25" for 16" / 24.5" for 18"